Pavan, a Bangalore-based sales professional in a company working as regional manager for India, needs to travel frequently to other cities like Delhi, Mumbai, Chennai and Pune. If he has to catch the early morning flight to Delhi, he needs to reach the airport at 5.15am, which is not easy. There are limited number of buses at that hour; waiting for them is not a wise thing. Pavan has an easy solution: Book a cab to the airport the previous day. Shekhar Mahadev, a software engineer working in Bangalore, says, “I have to keep making a lot of trips to cities nearby and usually it is fixed at the last moment. So there are rarely any chances to avail train tickets. Buses are uncomfortable for me. So I prefer taxi services as they are available even at the last moment.” He adds that he prefers KSTDC cabs as he feels they are reliable. Everyone has their own reason to choose a taxi. Some need pickups from and drops to the airport, some need to go out of the city for a while without having to wait for the buses. 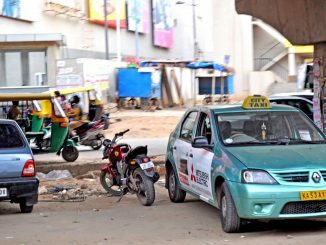 Today taxi business has grown to be a big industry in Bangalore, even as the population of the city has increased multiple times over the years. Taxis are a convenient mode of commuting across the city, especially for inter-city or airport trips. The cabs are also available for trips to tourism destinations inside and outside the city. Common services of all taxi agencies are point-to-point drop, pickup and drop from airport and out-of-station services. Their websites usually offer the customers specific pickup and drop points that the customer can choose according to their convenience. There are several cab options available in the city to choose from. Cab services like Meru cabs, OLA cabs, Easy cabs etc. have offers and options from which you can select according to your requirement. People from South Bangalore avail most of the cab services of these agencies. “We mostly get calls from Koramangala, JP Nagar, Majestic, M G Road, Whitefield and Bannerghatta Road. Most of the drop points are either in and around South Bangalore, or the Airport,” said Vikram Singh, a cab controller in Taxi Guy cabs. Their call density from customers is high during the weekends, he added. Hema who works at the call centre for Airport City Service says that most of the calls for pickup and drop for the airport are usually between 6am to 4pm and at midnight. Customers can book a KSTDC cab through phone or over internet. The website KSTDC cab services charge either per km or a fixed rate depending upon the area. Night rates last from 12 am to 6 am which would be 10% more than the morning fare. KSTDC cab services include pick-up and drop points from airport and railway station and back. The KSTDC has more than 550 cabs, which are owned by individuals but are registered with KSTDC. 24×7 cab availability and GPS-secured cabs top the list. The website provides the list of cars that are available for hire. Tata’s Indica and Indigo, Suzuki’s Swift and Dzire, Toyota’s Liva, Etios Sedan, Qualis, Innova, Mahindra Logan, Xylo and Tempo Traveller are the available choices. However, there are no photos of the above cars. KSTDC has set different tariffs for different packages. Along with travelling to Airport and back and out-of-station services, KSTDC also offers the facility to hire Post-paid drivers for customers of varying time schedules. Though the private cab providers such as Meru, Ola and Easy cabs have more dynamic websites than KSTDC, they do not list the car models. Ola cab has an android mobile app which enables you to book cabs without calling anyone. If you are in a city where Ola cab isn’t available, the company forwards the request to other companies like Fastrack, who provide you with drop and pick up services. Here are some taxi agencies in Bangalore. Most firms offer a 80 hours 80 km or 4 hours 40 km package. Car Models: Tata Indica (AC and non AC) and Indigo (AC), Mahindra Logan and Xylo (AC) and Toyota Innova (AC), Sedan or a Hatchback Premium cars such as The BMW series, The Mercedes series, Rolls Royce Phantom, The Audi series, Limousine, Jaguar, and Hummer. The price of these cars for hires starts from Rs.3500 to Rs.15000 per day. Easy Cabs claims to be India’s largest car hire firm. They provide services for in-city, outstation and airport travel. They accept payment by card also. Tata Indica, Toyota Innova,/Xylo, Ford Fiesta, Swift, Travera and Qualis. Has tourist package deals to Wonderland, Nandi Hills, Mysore and Hogenekal. They promise reaching your doorstep within 15 minutes of booking. Price ranges from Rs.6.50 to Rs.10 per km for different car models with a minimum of 250 km per day. Tata Indica, Toyota Innova,/Xylo, Ford Fiesta, Swift, Tavera and Qualis. From 5 am to midnight Rs.27 for the first km and Rs.20 for the rest. From midnight to 5am Rs.33.75 for the first km and 27 for the rest. They provide the option of tracking the hired car through GPRS. Price ranges from Rs.550 to Rs.1600 depending on the vehicle. Rates of vehicles vary from Rs.7 to Rs.14 per km. Minimum distance to be travelled is 250 km. Combined services of KSTDC, Meru and Mega cabs. Ph: 44224422, 47474747 or 49007777. For regular travelers who drive often to the airport or railway station, sharing a cab may make sense. There are many car pooling options that can be used by those who want to reduce the expense of travelling but still want the convenience of cabs. Commute Easy and Ridingo are two such options that let the commuters identify rides on same routes and use them, through simple apps. Ridingo allows cab sharing to the airport or event venues, especially useful when you go watch cricket matches! If you want to avoid the hassle of waiting for a cab and prefer to drive it yourself, then one can rent cars on a daily or monthly basis. Zoomcar, Cars on Rent (Easy Cabs) and Bangalore Self-drive Car are some of the services in Bangalore that provide cars on rent for customers. They charge per hour or per day basis. Some of them include fuel in their services, while some don’t. People with physical disabilities too want to live with dignity, without depending on others. Kickstart Cabs is a service for such people. The cabs are specially designed for disabled, elderly and those with temporary injuries, who need to travel to offices, rehabilitation camps or hospitals regularly or once in a while. The venture has just launched its services in Bangalore. Plan your trip efficiently. Decide ahead for how long you need the cab. Map your travel and discuss it with your cab driver too. He can help you with shortcuts and traffic zones with less congestion. Before hiring, make sure you are well-versed with both the large and fine print of the contract. Don’t become prey to any rude surprises from the driver about the fare once you reach your destination. Research a bit about the cab agency before procuring their services. Ask your friends or acquaintances about their preferences and also their best and worst stories before hiring. Always make a note of the number of kilometres travelled before you begin your journey, especially when you are paying per km. Number of tourists coming to the state via Bangalore has almost doubled in the last one year. This Kaapi trail is supposed to boost it further. EMBARQ India is conducting a survey to understand the impact of app-based cab services on mobility. Your response could help design better, long-term mobility solutions. Those looking to travel with their pets in tow can reach out to Petcab. This pet taxi service is available 24×7, and facilitates airport pick-up and drop, travel to the vet or boarding kennel, and should the requirement arise, to the pet cemetery too. The cabs are designed to ensure hassle-free transportation for animals. There is also the option of pets travelling without their owners for an additional fee. Classic Cabs has been running in B’lore for over 20 years. Booking a CAB/TAXI is real fun at MyDeals247! You just post a request to book the CAB for the days package. Instantaneously, MyDeals247 creates healthy competition among the CAB companies and brings you either top 3 or top 5 lowest offers within 30-60 mins. For instance, if you’re looking for a CAB for a long distance tours, you just post a request along with the trip details. You will see the top 5 lowest offers as low as 30 mins. It really helps you to get the best offers in the city. As you know, it is almost impossible to create the competition among the CAB companies on other websites. Everyone loves to bargain for the best price. Don’t you? Lets post a request for the CAB and checkout the best price today. Limo Cabs is a competent name among Car Hire Bangalore Service Agency in the city. The Cars here are perfect in condition and belonging to economy, premium, and luxury categories are presented before you to choose from the best car rentals service provider in Bangalore. If you are interested in car hire or car rentals, Take a look at our fleet of rental cars and vans, see the latest car rental. Just browse the tourism package. I like Olacabs. They offers Bangalore airport pickup in just Rs399.